The Journal of Genetics is among the oldest English language journals in genetics and has a unique history. It was founded in England by W. Bateson and R. C. Punnett in 1910, and later edited by J. B. S. Haldane. When Haldane and his wife, Helen Spurway, emigrated to India in 1957, they brought the journal with them. Haldane edited the journal from India until his death in 1964, after which Helen Spurway continued to publish the journal with Madhav Gadgil and H. Sharat Chandra (both of Indian Institute of Science, Bengaluru) and Suresh Jayakar (Laboratorio de Genetica Biochimica ed Evoluzionistica, Pavia) as editors. Upon Helen Spurway’s death in 1977, the journal was not published for several years (the last issue published by her was Vol. 63 No. 2 of December 1977). In 1985, the Indian Academy of Sciences, Bengaluru, revived publication of the journal with the permission of Lady Naomi Mitchison, Haldane’s sister and heir to the Haldane estate. The first issue published by the Indian Academy of Sciences was Vol. 64. No. 1, July 1985. Since then, the journal continues to be published by the Indian Academy of Sciences. The journal retains its traditional interest in evolutionary research that is of relevance to geneticists, even if this is not explicitly genetical in nature. 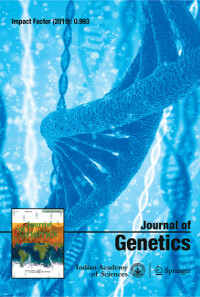 The journal covers all areas of genetics and evolution, including molecular genetics and molecular evolution.It publishes papers and review articles on current topics, commentaries and essayson ideas and trends in genetics and evolutionary biology, historical developments, debates and book reviews. From 2010 onwards, the journal has published a special category of papers termed ‘Online Resources’. These are brief reports on the development and the routine use of molecular markers for assessing genetic variability within and among species. Also published are reports outlining pedagogical approaches in genetics teaching. Journal of Genetics is now distributed in print outside India and online worldwide by Springer, co-publisher of the journal together with the Indian Academy of Sciences. On Springer, Journal of Genetics (www.springer.com/12041) is part of SpringerLink, one of the world's leading interactive databases of high quality STM journals, book series, books, reference works and online archives collection. Print subscriptions within India and open online access will continue to be served from Indian Academy of Sciences.